Home » Honey » Fake Honey-Why All The Fuss? There has been a never-ending collection of stories about fake honey in the media for some time now. And over recent days it’s led to a major news story in local news bulletins including the ABC News. The Australian courts are also busy with a brand defending these claims of one of their honey brands. 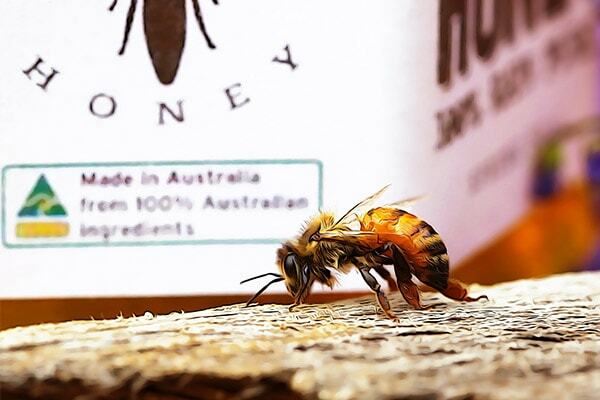 Claims that big and “trusted” brands of Australian honey may be dealing in adulterated honey. These claims include mixing local, in our case Australian honey, with cheaper imported blends from countries where the food industry is not very well regulated at all. In fact, many of these country’s own people look for quality imported honey from a place like Australia. Because they know Australian food laws are tightly controlled. And our local honey producers are constantly regarded as some of the best producers in the world. Labels that carry an Australian name are at an advantage to many competitors. And that means if the Australian honey is blended with a cheaper honey it is extremely deceiving. Furthermore, some honey blends have blended syrups like corn syrup and passed their product off as honey. Just a few years ago, the ACCC fined a company in Melbourne misrepresenting honey. So What Is Honey Exactly? Honey is defined by Food Standards Australia as “the natural sweet substance produced by honey bees from the nectar of blossoms…” Some products on the market are deceptively similar to honey. A classic example of this is “Vegan Honey” or “Bee Free Honey”. This is clearly misleading and some people seem to think they are helping bees by purchasing this syrup. Quotes seen include “a jar of vegan honey saves 7000+ bees”. And a little search on google will show you products like this. Ingredients such as “Concentrated Organic Coconut Sap, Organic Apple Juice Concentrate, Organic Artichoke, Orange Blossom Water”. Other vegan products claim traditional “honey is made from bees”. In fact, no bees are contained in honey. Honey is derived mostly from nectar collected by honey bees. So What Is The Government Doing About This Fake Honey Problem? This is not a problem easily solved but the NSW government have taken steps with truth in labelling laws recently. Also, the federal Australian government has made big changes to food label requirements recently. As of 1 July 2018, food producers are required to clearly display the country of origin food labelling information. These Australian made labels feature a kangaroo on the logo, and or a scale from 0% to 100% showing the amount of Australian ingredients in the product. Heavy fines have been put in place for those food producers and the suppliers of that food not following the new food laws. The Australian Government has produced a short video about this (see below). So Why Should I Care About Fake Honey? The problems here are endless. If you are not sure what you are eating or where it comes from, how can you be sure of the quality or integrity of the honey? Some honey producers in parts of Asia are selling honey with dangerous traces of pesticides. The substitution of corn syrup and other syrups for honey is widespread. There are also products claiming”sustainable honey made from Certified Organic apples” sold in Australia and worldwide as a supposed good alternative. When these types of products are not honey at all. The use of the word “honey” attached to a syrup or product that does not come from bees, simply isn’t honey. Some beekeepers have identified more deception of this type with labelling with a word spelt very similar to honey. The pronunciation of these products are exactly the same as honey and cannot be differentiated verbally. When it’s likely these products are more closely related to syrup than honey. The most important part bees play in our world is not honey production, but pollination. If consumers choose not to support genuine local honey producers, the effects will be multiplied through many aspects of agriculture. Plus flowers or ornamental plants that are pollinated by bees will also suffer. Not to mention the crops like clover that are pollinated by bees and are a large part of the diet of livestock. There have been some excellent documentaries and news articles published about the fake honey traded around the world. One of the best we’ve seen is on Net Flix and if you haven’t seen it already, it’s a great resource. It’s part of the doco series called “Rotten” S1 E1 “Lawyers, Guns & Honey”, we highly recommend you look at it. Buy honey from local beekeepers. Or from a honey brand who can provide support that the honey is genuine. You can also contact your local beekeeping association that often sells 100% natural honey from bee enthusiasts in your local area. Pure honey is not only natural and better for you than the fakes or substitutes in the market, your taste buds will love it. And you will help to save our bees. And if you thought perhaps is there more you can do to save bees, check out our recent post on the 5 simple ways you can help here. Thanks for a clear informative article.